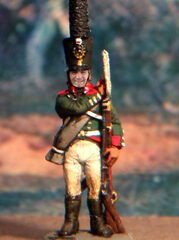 Since 1975 i paint and collect 1/72 plastic toy soldiers of the Napoleonic Era,in these decades although my sight get weaker, my hand get smoother. I keep to find and develop new techniques in converting, painting, transforming these little guys, and i would like to place here some of it for the other lover of this art. 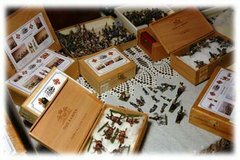 I don't paint for wargaming or for dioramas, but i would say that this is for me a sort of "Zen" practice, a miniature art which keep me calm and hold the deeper emotions of my childhood alive, a sort of remote soul; after painted i photograph and i store the soldiers in small cigar boxes between cotton wool, each box with his own label. The pleasure for me is to open the boxes now and then, and enjoy the disclosed beauty of the content. Also photos help a lot to give the right athmosphere and pathos and it is an easy way to see and enjoy every detail and every composition. My goal was to reach all the units and all the armies who fought in that colorful time, but i think i will have not enough days in my life to reach this aim, but i keep the illusion with me, like a mirage in the desert. About myself , my name is Francesco Messori, I'm Italian, born in Modena the 19 november 1961, but actually living in Amsterdam in the Netherlands; I'm an architect and enjoy my work. i live with Patricia and 2 beautiful cats. I have a beautiful daughter Vera.